Well speaking of a Plate. I have a full Plate today with this post. I entertain one night each year during the World Series. It has been a tradition to invite our friends who lived next door to us for 10 years to come over for an evening and enjoy supper and watch the baseball game together. In the past we have eaten Hot Dogs and Cracker Jacks and many other Baseball related dinners. So, this year I have prepared the table and the main dish with a Hearty, flavorful and satisfying Italian Minestrone Soup. Our friends will be bring the Bread and Salad. I will make the dessert. Which is very Italian. As we fell in love with Tiramisu on our trip to Italy this summer. Fall is in the air, we are so close to Halloween and the San Francisco Giants love Orange. I thought, I would have a pumpkin theme. And, as you know, I'm trying to be very thrifty during this economic downturn our country is now experiencing. The glittered pumpkin I had last year and I added more glitter this year. The Rust Mums are from my garden and the black candle sticks I painted black for more punch and the box I painted black too. This tablecloth is 50" by 96" since I have a very large table in the dining room and I usually buy two tablecloths. One for the short version of our table and add the second tablecloth 50" by 72" when the table is extended to seat 14 people. I decided for this post I would cut the small tablecloth up and make 6 napkins to match. I found the pumpkin napkin rings at the antique mall for .50 cents each. And, the gold 12 place setting of flatware I bought at the antique mall. It wasn't expensive because it's coated stainless steel. I thought if I washed it the gold would come off, but it didn't. The little green juice glasses I used for my tea lights. I bought them 20 years ago at the GW. They are festive for Christmas morning . I'm trying to photograph night shots with the reflection of the candles flickering. I have owned the Soup Tureen since 1970. More Vintage !!!!!! The Soup Bowls are part of my everyday dishes I bought from Ballard's in 1990. The larger Dinner Plates I bought at World Market. We use them when we have BIG MEAT. I love these chargers .99 cents store. Southern in My Heart for Inspiration Friday. There's a version for every town in Italy. 1 cup dried kidney beans or white beans. Revised and Enlarged. Published 1956. 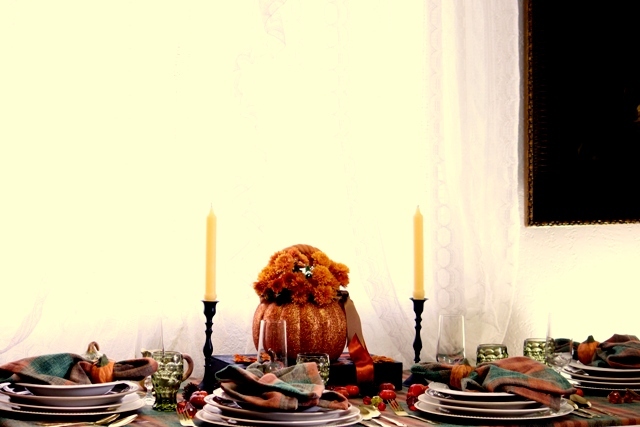 Love your fall table seeting. I would not know how to eat that fancy. I would take a bowl of the stew anyway I could get it. Hi Betty! I absolutely love everything about this post and had to scroll up and down to make sure I didn't miss anything! :-) I'm so thrilled you are going to be joining in BOTH parties this weekend! It is totally an honor to have your gorgeous tablescape and your delicious soup making an appearance. Thanks so much! Looks beautiful- so welcoming and colourful.Reaally amazing- love it ! Betty everything is so beautiful! I had to take a moment at each picture so I could take in all of the details. 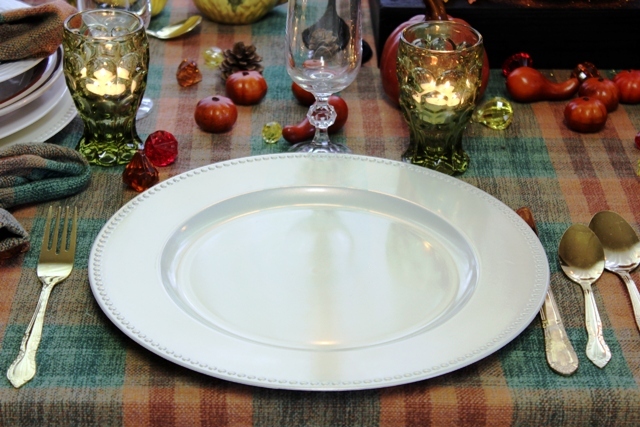 ANY guest would be proud and honored to sit at your beautifully decorated table. Kuddos! Lovely table!! And what a great sounding recipe!! Thanks for sharing. Happy VTT! I want to sit at your lovely table and enjoy that delicious soup! Oh my goodness! Your table's very pretty, love the green glasses-and the soup looks fab! I love your table linens. What fun to host a party during the World Series. Go Giants! 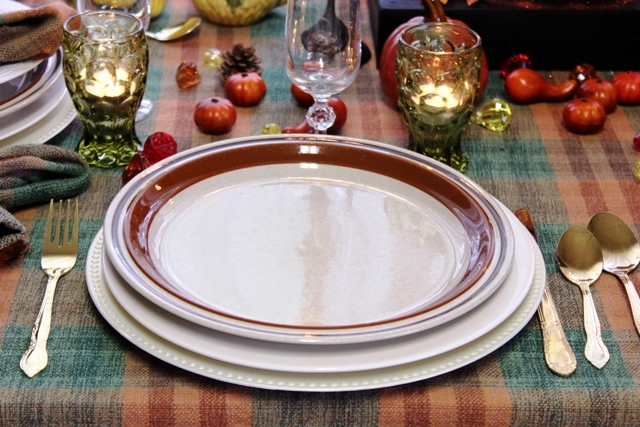 Your table setting is so pretty and the soup sounds and look yummy! Lovely. I find candles and glitter are particularly difficult to photograph. I like your tablescape very much. Happy FF. 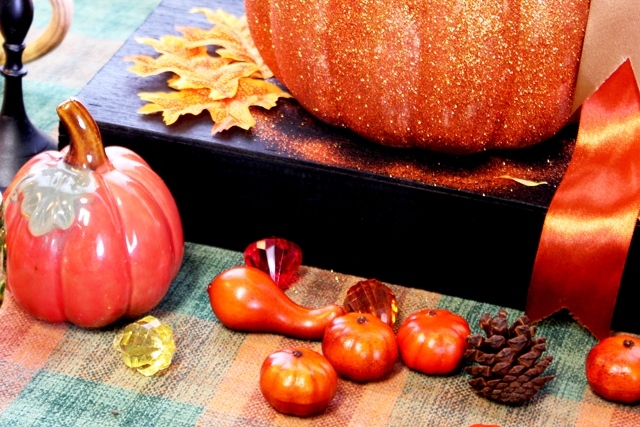 Beautiful fall table and I love the glittery pumpkin. The minestrone looks delicious, too. A perfect Autumn recipe! Beautiful tablescape Betty! 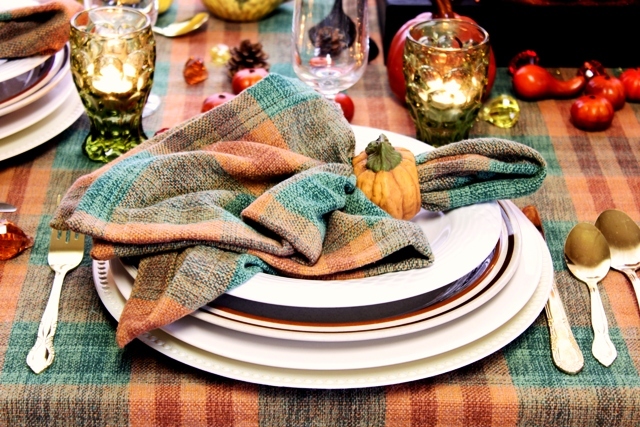 Many times when I find a great deal on table cloths, I will buy one to make into napkins. It usually is less expensive than buying the ready made ones. 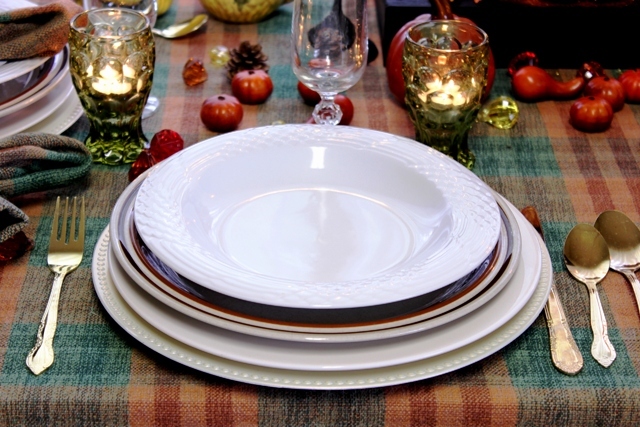 Lovely Autumn tablescape, Betty! I love the colours and I have the same silverware! Thanks for sharing and Happy Pink Saturday. 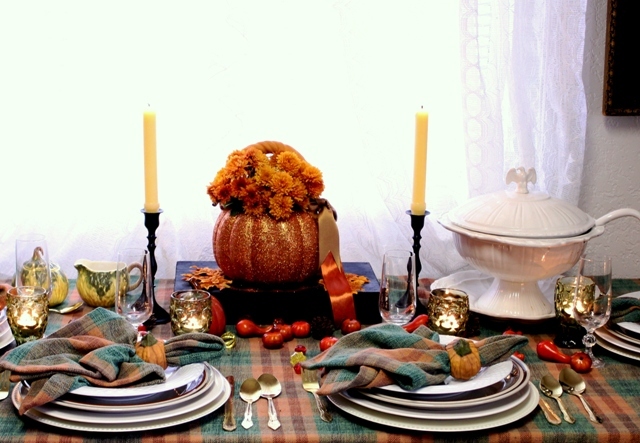 What a fabulous tablescape-just absolutely beautiful for fall in every way! Hello, Fellow Gemini!!! 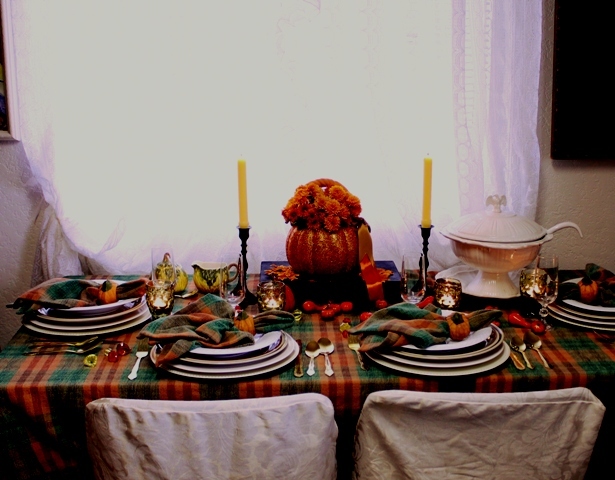 Beautiful table, and that soup tureen....FABULOUS!!! I had missed this on BTNOP. I had a busy week and didn't get to as many as I like to. I'm SO GLAD I stumbled back here from the Sister Saturday Soup party! 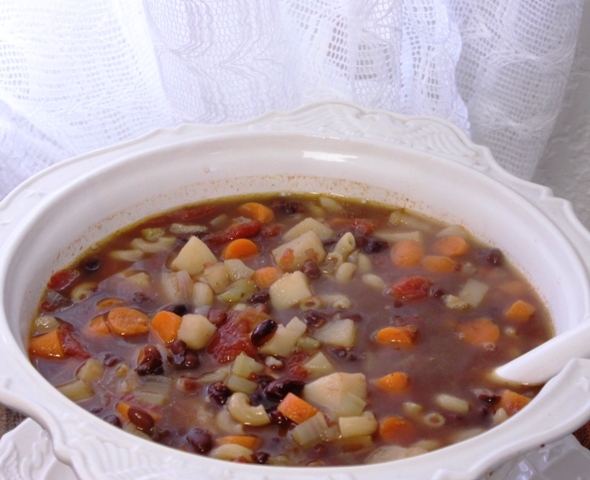 Your minestrone looks delicious, and I think your table is so pretty! 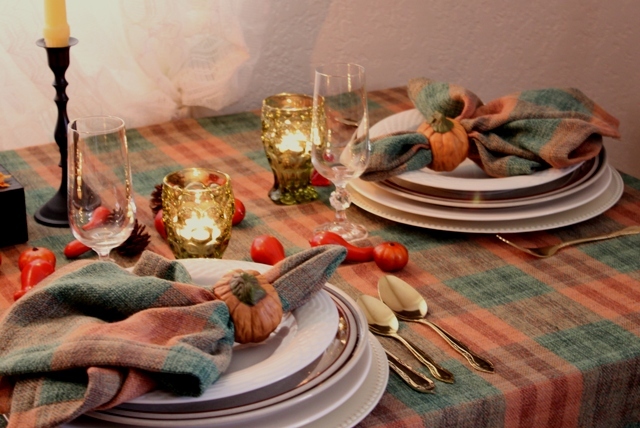 I love the table cloth and napkins, and that centerpiece is lovely. Just a great post from beginning to end. Hi Betty! I just had to come back over and say thanks again for linking this up to the party today! It was fun to go through this post again and I noticed more details this time...like those gorgeous little green glasses. Those are so sweet and I may have to keep my eye out for something similar for the holidays! Loved your Pink Fall Saturday post. Everything was so beautiful. The recipes look delicious. 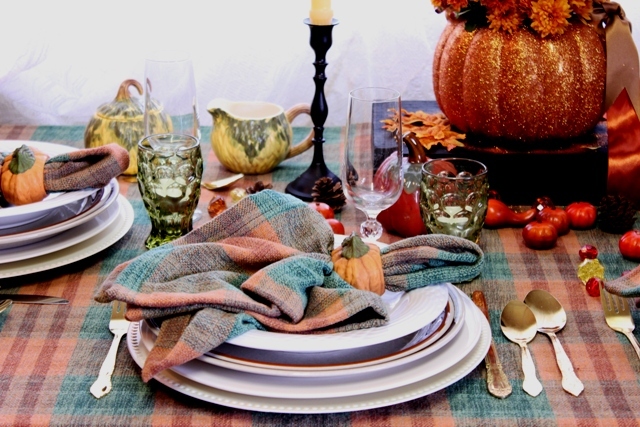 Beautiful fall tablescape...perfect for the season and the soup looks so delicious!!! 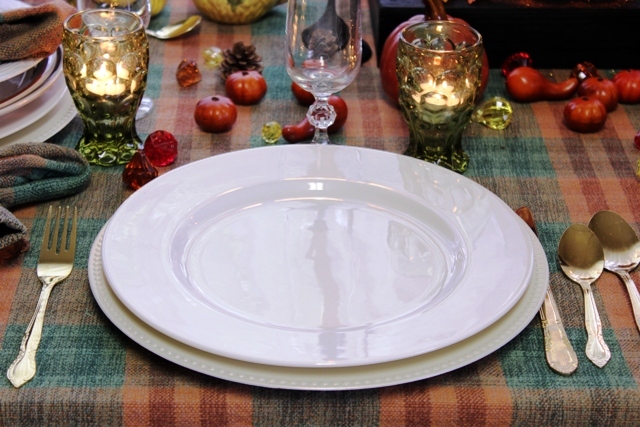 Love the tablescape and the soup sounds wonderful! 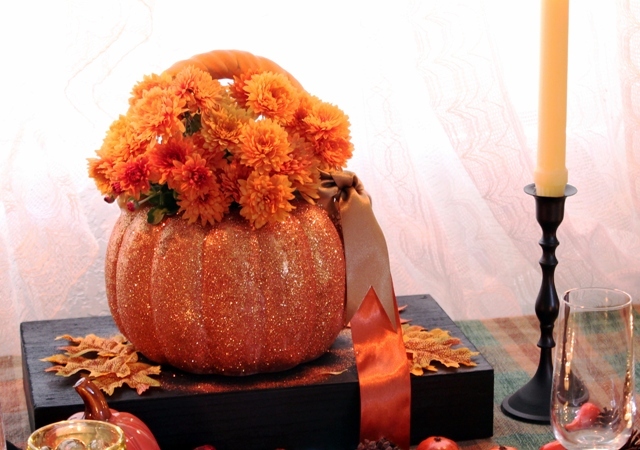 I love your glittery pumpkin with the flowers. Great idea for a vase! 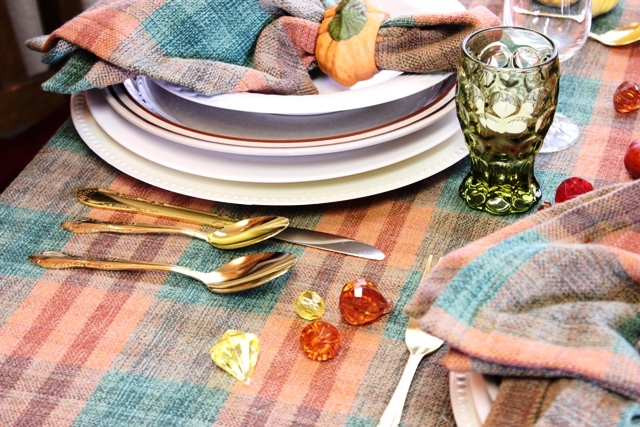 What a beautiful tablesetting and I love the pumpkin napkin rings. That soup looks absolutely fabulous. Thank you for sharing. Love the table! very brave to cut up a tablecloth for napkins! I've even purchased another tablecloth when napkins weren't available!! That soup looks amazing.. thanks for sharing.